Where to Use Which Types of Paint? On bare plasterboard or plasterwork, the first coat of paint should be what is called a ‘mist coat’ and this should always be a matt or vinyl matt emulsion paint. Never use vinyl silk paint for a mist coat. The mist coat needs to be well watered down to ensure it is both absorbed by the plasterboard or plasterwork, but also seals it so that remaining coats of paint adhere fully to the wall. After that, or on previously painted walls, there are three choices of paint finish. Flat matt is dull in finish and does not reflect light in the way vinyl matt or vinyl silk will. Flat matt paint is often used on older properties with unevenly plastered walls as the lack of sheen hides unevenness of the surfaces. The problem with flat matt paint is that it marks very easily and very soon it can begin to look tired, especially in heavy traffic areas and doorways where you are most likely to brush against a wall. Vinyl matt is a good compromise in that it is lightly less prone to marking, yet still has a fairly non-reflective surface. 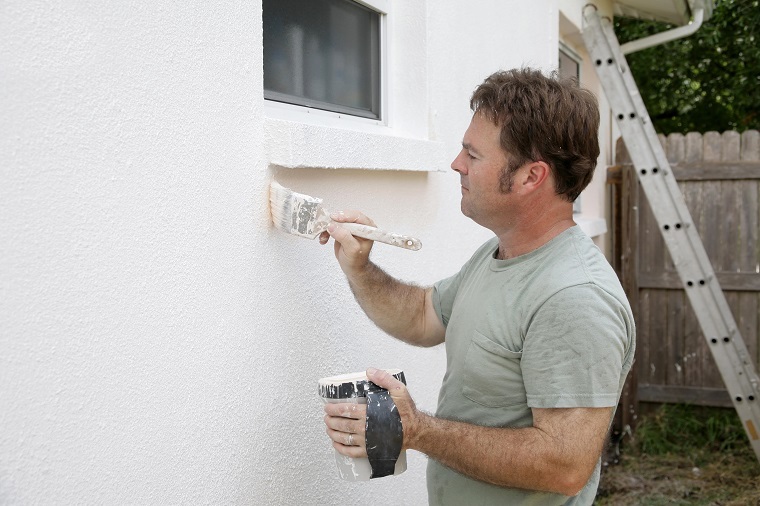 It is probably the most common paint used today, especially in new-build property. Within reason, the vinyl element means it can be washed, but only gently. The third member of the family is vinyl silk. This is a mixed blessing of a paint as it solves one problem, but can create another in its place. Vinyl silk has been seen as a wonderful paint for bathrooms and kitchens – rooms with a lot of moisture in them and also rooms where walls are likely to get splashed with a wide variety of products. Vinyl silk is very easy to wipe clean, hence its popularity. However unlike matt finish paints, vinyl silk does not absorb any water but instead allows it to lie on the surface, evaporating when the room warms up or through natural evaporation processes. However if a room is not warm enough, has cold spots (often in high corners), or is not well ventilated, black spot mould will begin to form very quickly, which can be quite an eyesore and frustrating to have to get rid of on a regular basis. Vinyl matt is a more than suitable paint for bathrooms and kitchens as it can still be wiped clean and is less prone to the creation of blackspot mould. Aside from primers and undercoats, there are three general paint finishes for wood - eggshell, silk and gloss. Eggshell is a flat matt finish and while striking in its effect, its location for use has to be careful as it is a surface that marks easily. Eggshell paint is an interior finish for wood. Satinwood is a cross between eggshell and gloss. It is a wonderful compromise as it does not mark easily, yet is not too reflective. If white satinwood paint is used, it will usually retain its brightness for longer than white gloss paint. Oil-based satinwood is used purely on interior wood, but a water-based satinwood from the Dulux Weathershield range can be used on external woodwork. Gloss paint is highly reflective, so needs to be used on perfectly flat surfaces. The most appropriate use of gloss paint is on an entrance door to a property which, if painted correctly in gloss paint, will have a high sheen and will repel water with ease. Also, see our article on 'Understanding Paint Types'.